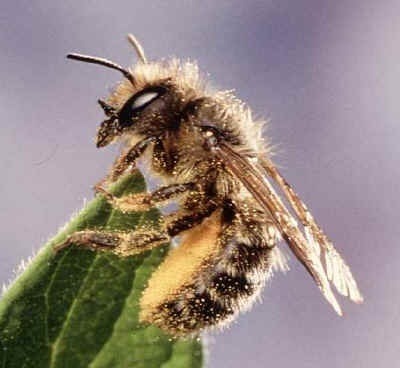 If you’re thinking about keeping solitary bees in your garden, consider Hornfaced Bees. They may not be as pretty as their counterparts, but they are sweet and get the job done. Hornfaced bees (Osmia cornifrons) have been used to pollinate Japanese orchards for about 60 years, and their popularity is increasing rapidly. They replace honey bees as orchard pollinators because they are so efficient and easy to keep. Only 300 to 400 female hornfaced bees per acre of orchard are needed. Hornfaced bees are a species of mason bee. You can keep them together with orchard mason bees, other native bees, and honey bees. Hornfaced bees are gentle, and thus they are suitable for home gardens and nature study programs in addition to their use as orchard pollinators. Hornfaced bees are not attacked by the mites and diseases that trouble honey bees, they don’t store honey, and they cannot breed with Africanized (“killer”) honey bees. They are solitary bees. Instead of having queens and workers, each female hornfaced bee mates, makes her own nest cells of mud, collects nectar and pollen for bee-bread, and lays eggs. Hornfaced bees are gregarious, preferring to make their nests in the vicinity of other hornfaced bees. Unlike honey bee drones, male hornfaced bees visit flowers, contributing to pollination.